A Nottinghamshire farmers son developed a fish bait manufacturing and distribution business. Initially started in an old corrugated steel sheet barn, the business took off and expanded to over 40 full time staff. 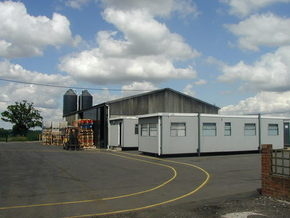 The temporary portacabin offices and staff facilities and the old building were just not adequate and up-to-date facilities were required. The local authority, Rushcliffe Borough Council, objected to the proposal for a new building claiming the change of use (COU) from agriculture was not appropriate to the rural area. Using Government planning policy guidance and legislation Landyke persuaded the authority to realise this was a farm diversification scheme and suitable to the location. To do this Landyke designed a building to look like a conventional grain barn but with all modern industrial specifications, complete with integral first-floor offices and staff facilities. Landyke's proposed landscape scheme and car parks met both Rushcliffe Borough and Notts County Council requirements. An enterprising farmer's son in Nottinghamshire has developed a fish bait manufacturing and distribution business. Initially started in an old corrugated steel sheet barn, and expanding to portacabin offices and staff rooms, the business became a huge success story and now employs over 40 full time staff. However, the local planning authority objected to the application for change of use and to the proposal for a new building to replace the rusting corrugated barn stating the use was not approriate to the rural area. 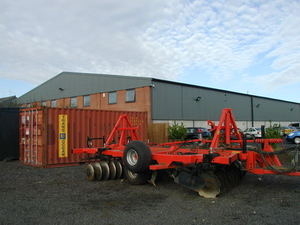 Using Government guidance and legislation (PPS7 and other guidance) Landyke persuaded the authority to realise this was a farm diversification scheme and suitable to the location. with integral first floor offices and staff facilities. Landykes proposed landscape scheme and car parks layout met both Borough Council and County Council requirements.